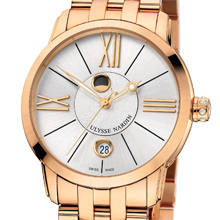 Ulysse Nardin Classico Luna for Men and Women. The sun is a constant – a blazing sphere of light that rises each morning. The moon, equally stunning, illuminates a sense of mystery. Changing every evening – from the delicate shadow of a new moon, to the jagged “D” formation of a waxing moon as it grows from new to full, to the smooth “C” shape of a waning moon as it minimizes from full to new – its lure has affected and fascinated the natural world for millenniums. Honoring the moon’s majesty is the new Ulysse Nardin Classico Luna for men and women. A traditionally styled timepiece, the Classico Luna draws inspiration from the moon in a different way. Similar in principle to the limited-edition Moonstruck’s indication of the moon’s phases and based on a development with Ludwig Oechslin DNA, the Classico Luna precisely depicts the moon’s rotation in a realistic representation. The moon reflects the light of the sun as it rotates clockwise around the earth, and the Classico Luna depicts its angle of illumination as its moon rotates around the center of the timepiece – a portrayal of earth – making one rotation in 12 hours. In its speed to fulfill its moon phase circle in 29.5 days, the color of the moon phase disc will change, increasing and decreasing as the moon wanes or waxes. A self-winding watch, the Classico Luna makes reading the moon’s phases simple. The moon phase is set over a corrector at the 4 to 5 o’clock position. Inventive in true Ulysse Nardin form, the Classico Luna is equally pleasing to the eye. 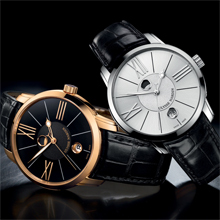 For men, the Classico Luna is an elegant, classic and slim dress watch with a traditional dial design with a silver and black background and straight indexes. Yet, for women, the Classico Lady Luna is expressive, honoring the moon’s powerfully feminine mystique through its glamorous aesthetic, particularly when set with diamonds on the bezel. The Classico Lady Luna is available in stainless steel and gold, with or without diamonds, and with one dial version made from the beautiful and enduring mother of pearl. As earth goddesses nurture, the moon maneuvers the ebb and flow of life’s tides. 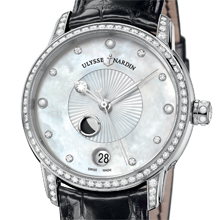 The Ulysse Nardin Classico Luna brings the moon’s magnetism to its wearers every day.